Create email templates for notifications. You need to select the templates you want to use in the calendar settings. Same templates can be used in an unlimited number of calendars. Button 1 - Click to add a new Email Template. Step 1 - Click to display the Email Templates information. Field 2 - Change the name of the Email Templates. Field 3 - Select the language for the Email Templates. Field 4 - Click the dropdown list to select which Email Template to modify. Field 5 - The Subject for an Email Template. Field 6 - The email information. Step 7 - Click to Delete the Email Template. 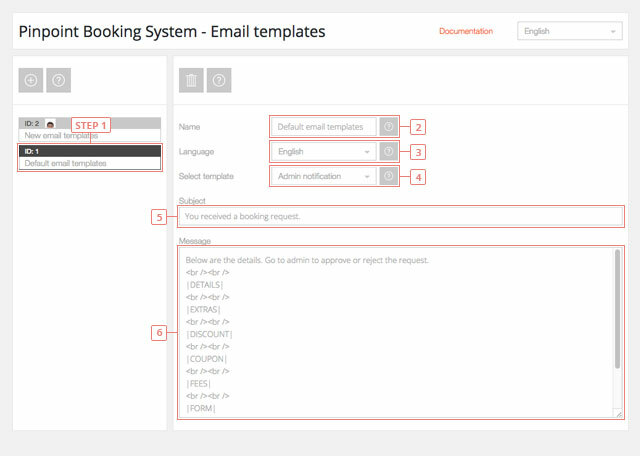 If you are using multiple languages make sure you translate the email template for every language.Change the language with button 3. The information that admins and users see is added with shortcodes.